Summary: Kettler are proven to be a reliable brand, and name all of their different equipment types with a single letter. The Kettler ‘M’ exercise bike is a solid mid-range model. This bike comes with some extras including console with preset programs, heart-rate monitor (including ear-clip!) and magnetic braking (resistance). Many models with magnetic (rather than belt) mechanisms cost more than this – and when you take the amazon discount into account you have a great value machine. Solid feedback from previous buyers for the Kettler M Bike too. Check out the product page over at amazon.co.uk for the full spec. The Kettler Cycle M is a great ‘get on and go’ model that’s perfect for those new to exercise bikes, especially if you are looking one step up from the squeeky and rattly budget models! The Kettler Cycle M is a durable bike built to survive everyday use. The seat height is adjustable up to 25cm and can support people weighing up to 110kg (just over 17 stone), making it suitable even for the tallest / largest of people. The angle of the handlebars can also be adjusted for extra comfort. When it comes to setting up the bike arrives partly assembled with all the tools required to finish the job and easy to follow instructions. Even if you’re a DIY novice you should be riding within hours. This bike’s real value can be found in it’s onboard computer which continuously measures speed, distance, energy consumption and pulse rate via sensors fitted in the handlebars. One of the best features of the bike are the recovery tests which monitor your fitness every time you use the bike and give you a mark so you can track your progress. In terms of quality, this is a mid-range model and casual users will certainly find this covers all their needs. It’s sturdy and the manufacturer offers a 3-year parts and labour warranty to give added peace of mind. It’s compact and quiet to move, so for those with limited space at home or in the office, this bike will be the perfect fit. It has 8 resistance stages which is less than many other models and doesn’t have any built in exercise programs making it more difficult for to keep workouts varied and interesting. The fitness tests mitigate this problem somewhat though. Reviewers have all noted how easy the bike is to assemble and how quietly it works. Those that did have problems all praised Kettler’s superior customer service. The only complaint came from some people that said the saddle was a little hard, however a gel pad or small pillow seems to solve this problem quite effectively. You could even get this popular supersize exercise bike saddle alongside. Others also had problems with the pulse sensors on the handlebars, although this can be a problem with all exercise bikes and certainly doesn’t affect everyone. Overall this bike’s lightweight design makes it perfect starter model for a small home gym and the novel fitness tests will keep even the most unmotivated working hard. 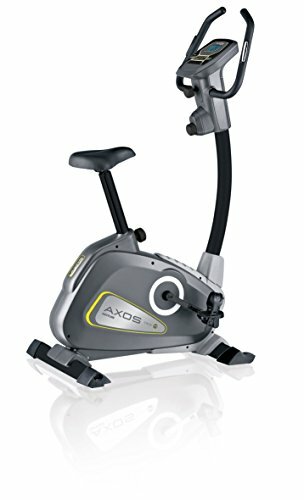 Check out the user feedback and see the latest amazon.co.uk discount for yourself over on the Kettler M Exercise Bike product page.